Whilst gold continued to surge higher in yet another strong move yesterday, spot price silver remains waterlogged at the current level, only benefiting in a minor way from the bullish momentum clearly evident in the gold market. 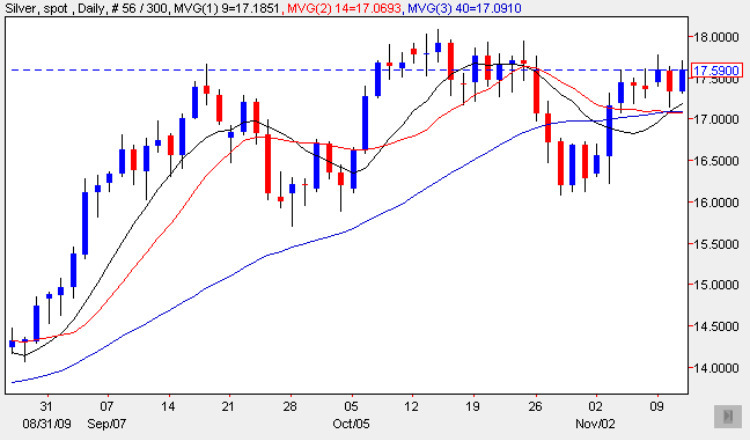 As a result of the pull through from gold, spot silver ended the day marginally higher, with a narrow spread up candle that found good support from the 9 day moving average, a positive signal, which suggests that the market is now beginning to recover some of its bullish momentum once again following the breakout of two weeks ago from the strong sideways price action in the $16 to $17.50 per ounce price region. However, given the strength of the move in spot gold, the equivalent move for silver was decidedly muted, and therefore a worrying signal that there remains an undertone of bearish sentiment which is holding silver lower at present. Technically we have just cleared the deep price congestion area above the $18.50 per ounce level, but perhaps not enough to suggest that we are clear of this level for the time being, and for longer term trend traders my suggestion would be to wait for a clear and hold above $19.00 per ounce before entering any longer term traders. In the short term, and with the moving averages suggesting a move higher, small long trades are the order of the day at present for intra day silver trading.